Misery loves company ... so if you've had a bad day, look here! The purpose of this webpage is to help you avoid problems. It also may serve as a "how-to" for new builders. If you have a better solution(s), please let me know ... I'm still learning. The tyranny of building in metal is drilling with a centric, sharpened drill bit the correct size hole in the exact right place perpendicular to the surface resulting in a perfectly round hole. I have found that error-prone procedures fraught with opportunities to ruin an assembly are best left for the next day when you are fresh rather than at the end of long, tiring day. Also, turn off the TV or radio. As Charles Snyder communicated to me, once the parts or sub-assemblies are in place there is the strong desire to complete the part that same day. 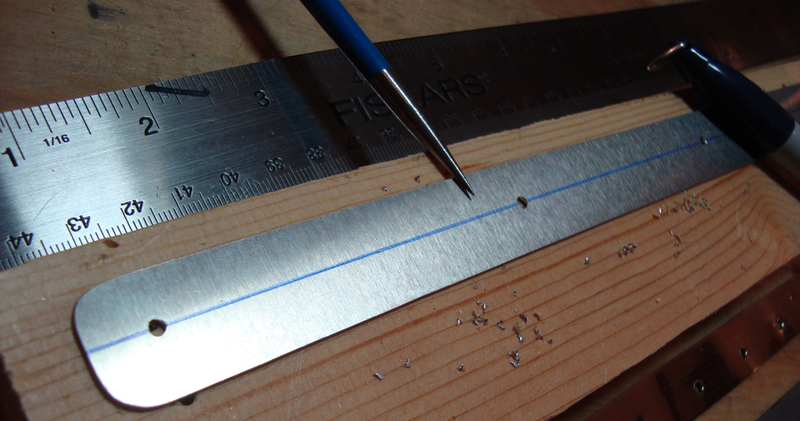 Normally, I do the final drilling and riveting the next day after carefully checking the fit of the parts. 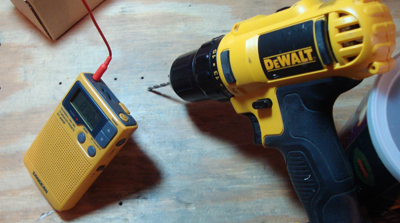 Always check your drill size with a precision hole gauge ... always. Don't assume the bit is the correct size because ... well you know. 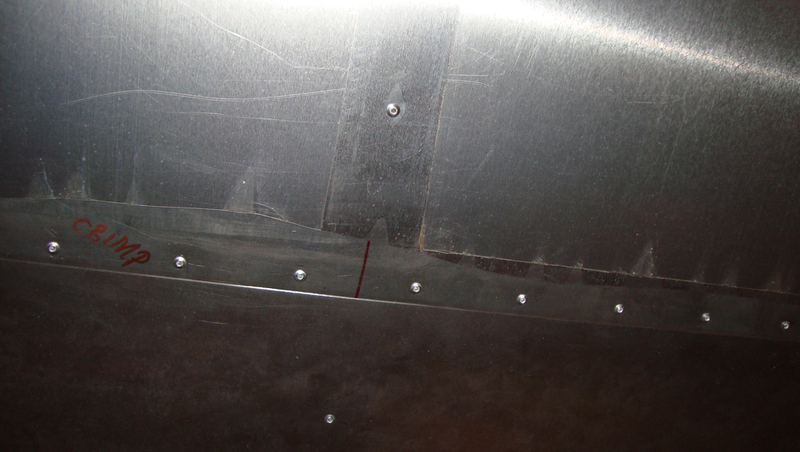 Conflict between wing skin rivet and wing attachment fittings. I decided to drill the holes on the top of the spar cap slightly closer to the angle corner (to enlarge the edge distance). During the final stages of assembly, I found that there was a conflict between the skin rivets and the wing fittings. In the far upper left corner, you can see the flush tail on the wing skin rivet with no interference with the wing root fitting. It looks great ... but no one will ever see it. Note: the spar cap continues another two inches to the left. I considered several alternatives. One was filling the hole in the skin by epoxying a rivet into the hole; and, then drilling another hole closer to the edge. The final solution was to to countersink the buck-tail or worked-end of the rivet. 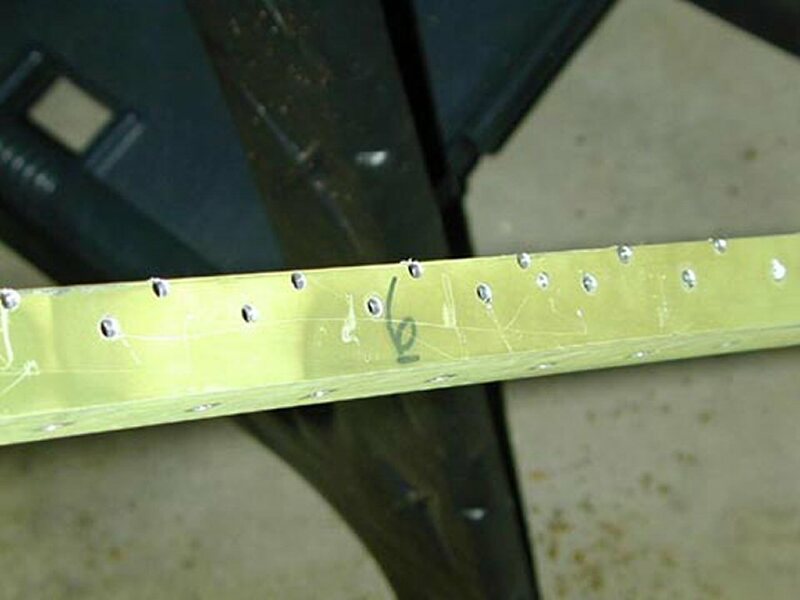 The procedure required numerous trials on scrap aluminum of the same total thickness changing the length of the rivet and the size of the countersinking. These would be rejects ... just practicing. 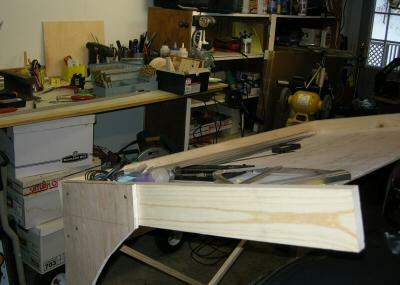 After the wing is totally riveted and closed up ... I discovered a Cleco "buried" in the exact center of the rear spar. I was literally installing nearly the last Avex rivet when I saw the points of a Cleco sticking out. Do I leave the Cleco in place? Will it reduce strength in the critical aileron attachment doubler? 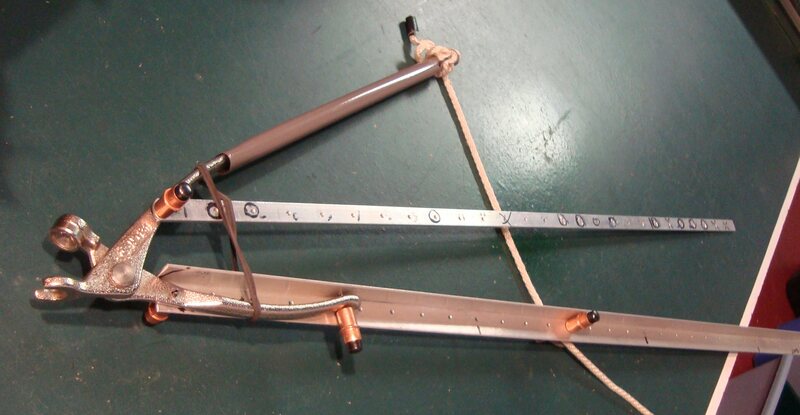 Designed "4-foot arm" to remove the offending Cleco. Not my work! My guess is that the builder was using matched-hole drilling guide or duplicate part which hid this part below. I always look at the back side before drilling. I clamped a previously drilled spar cap to a new angle as a pattern for drilling holes on the last spar cap our of of ten. 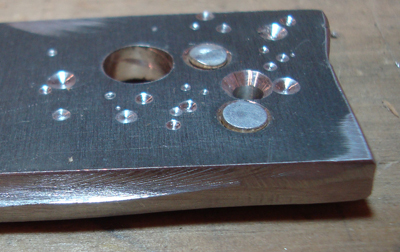 After completing the drilling, I discovered I had built a mirror image of the desired part. If I had made this mistake earlier, I could have used the mirror image on the other wing ... but this was the final spar cap for all three wing sections! Order more angle material and build another part. 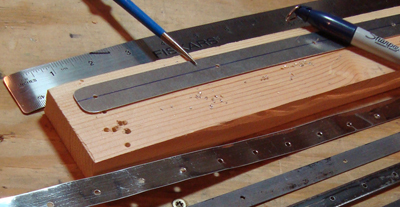 The drilled scrap part became part of a fixture to hold the nose ribs in place when skinning the wing. Mis-drilled holes in Spar Cap According to an 2009 email to my Technical adviser, I had rejected three spar cap angles (out of 10 total). In one case, I had drilled an extra 1-inch spaced hole for rivets into the area where bolt holes are required for the root fittings. In the other case, somehow I drilled two holes where their edges were 1/32nd inches apart. Reject the parts and rebuild. Mistakes in a spar cap are forbidden! When making the second wing panel, I decided to improve my hole guide for the nose skin rivets. Click to see the rejects! I checked this new guide against the holes in an old rib from the left wing which had been moved to the right wing and found that all but one hole lined up perfectly. I used .025 aluminum rather than steel strapping because it is easy to drill accurately and won't scratch the wing skins. Since the number of holes drilled is so low. the guide won't be worn out before the wings are complete. Twist built into wing spar. With the D-Cell or nose section of the wing panel resting on the workbench, I noticed that the one corner of the spar cap was nearly 1/4 inch higher than the other three corners. After much measurement, I determined that nose skin was causing a slight bend in one spar cap resulting twist in the right or root portion of the D-Cell for the wing panel. 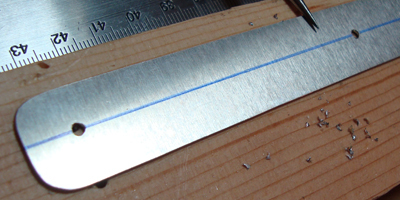 This bending of the aluminum angle demonstrates the forces that .016 sheet aluminum can exert on the D-Cell. I determined that the cause was the edge of Cleco had caught on the blocking. When I vacuum formed the nose skin, I had included an extra inch of material so that the ends were even for taping. So, I could reverse the nose skin and re-install it. The previously drilled holes which caused the twist were now the "extra inch" of material that could be trimmed off! Due to matched-hole drilling the corner holes that were on the bottom of the nose skin now fit perfectly on the top spar cap. I placed a Cleco-assembled spar on my drawing table. A small voice told me that was dangerous ... but it was just for a few minutes. Before I could move the spar, my wife drove into the garage and nudged the table, the spar fell to the floor and impact created a small kink in the root end of the spar web. It took only two hours to cut a new section of web and match drill using the damaged part. 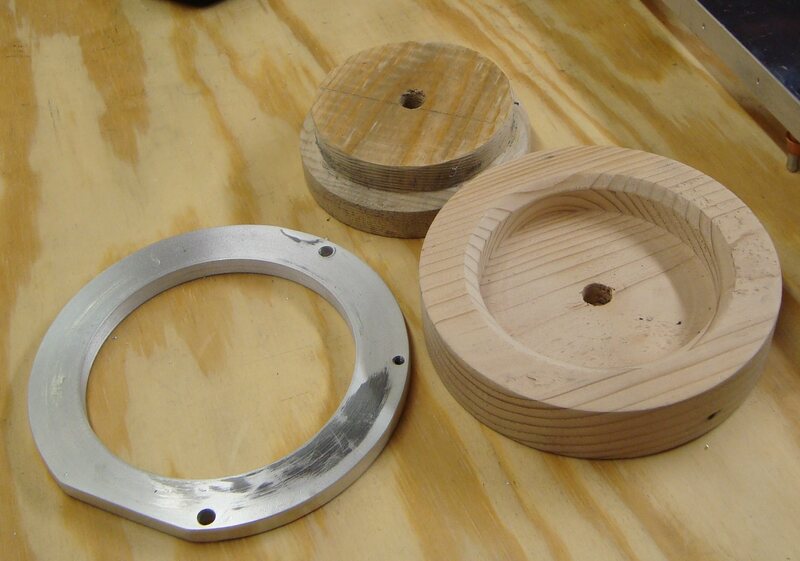 Drilled the 2-inch spaced holes on the spar flanges off by one inch. The plans call for holes to be drilled on the upper flange of spar cap for attaching the wing skins. These holes should line up with the ribs. I decided to measure from the wing tip rather than the wing root. BUT ... the ribs at the wing tip are 15 inches apart NOT 16 inches! Thus, the holes did not line up with the ribs. No fix required. Only impact was having to drill an extra hole at the point where the corners of all four wing skins overlap; thus for one two-inch space the the holes are 1-inch apart. I will do it correctly on the next wing panel and see if anybody notices that the rivet patterns are slightly different between the two wing panels. 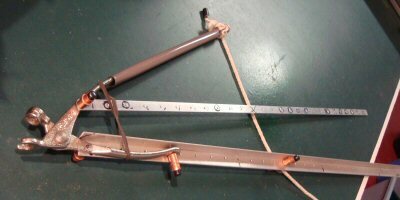 Failure to properly force parts to conform to the jig resulted in undersized part. In addition to the solution to the right, I build the ribs and assemble them with only one hole drilled for each pair of holes. 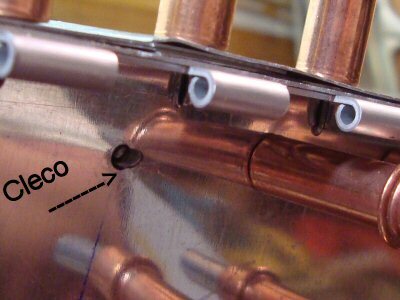 If the error is very slight: 1) remove the Cleco, drill the second hole with parts properly aligned; and then 2) re-drill the first hole with a 1/8th inch drill bit. If the enlarged hole looks OK, use an oversize solid rivet or or the Avex pulled rivet. 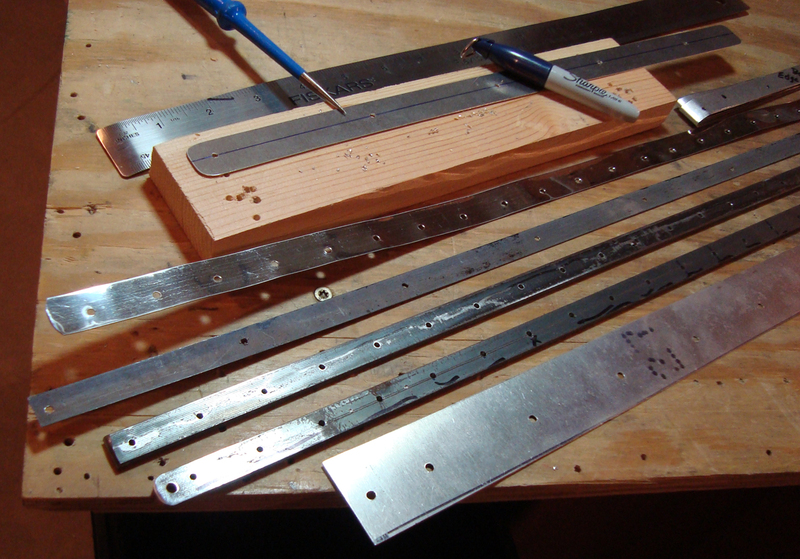 Solution: Analyze assembly then select which part to remove (either by drilling out the rivets or removing Clecos if you discover the problem before riveting). Build new part and install properly. The removed part can usually be used on the next rib. If not, toss ... it's a cheap small part. Page 5, left-center: A note underneath the mid-rib drawing notes that the wing is not flat. The undercamber seems to be about 1/8th inch. Decided to build a flat bottom wing just like a J3 Cub. Creating undercamber would require metal stretching on the rib flange reducing strength. For future rivets, develop better techniques for drilling out bad rivets. Electric Drill? Pocket radio? While cutting a nose skin from a 12-foot roll of aluminum ... just as I finished ... I leaned over and a small portable radio dropped out of my T-Shirt pocket onto the nose skin. Small dent ... piece ruined. Cut out another nose skin. I of course used the dented nose skin to build other smaller parts avoiding the dent. As for the drill ... lay it down flat ... always! Flanging dies cause distortion in wing spar web. 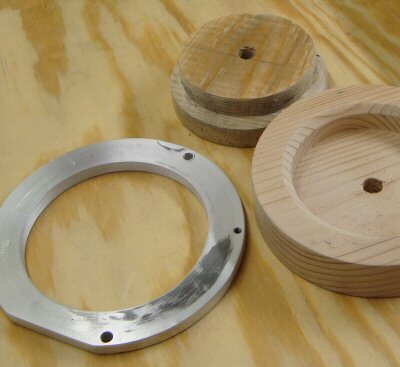 My flanging dies are the two wooden pieces turned on a lathe by Dale Johnson. Using these alone caused a bulge in the spar web next to the hole. The material specified for the spar web is highly tempered. 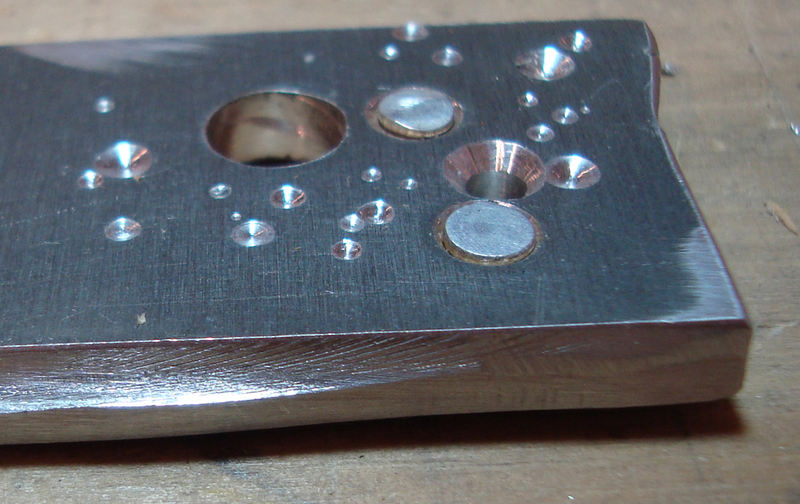 Ignore the three holes and flat edge ... aluminum came from the "scrap" bin. Solution: I asked Dale to make an outer metal flange which is clamped tight to the top surface of the spar web with the female die below. This holds the spar web flat while the male die is pressed into the hole of the female die forming the flange (I use a bolt and nut which is wrenched down ... some builders use hydraulic pressure). Simple fix (especially when a friend builds the fixture) ... very effective. Copyright © 2009, by S. Steve Adkins, all rights reserved.